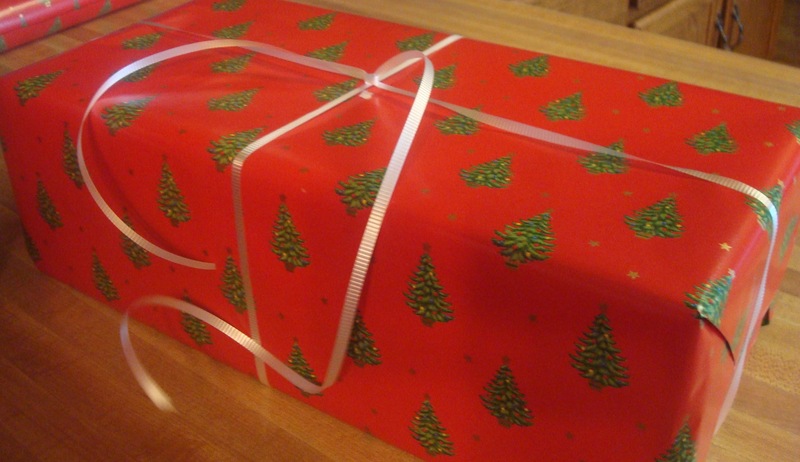 Please note that I am using wrapping paper with a Christmas design. 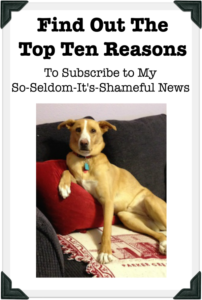 You should not. Also note I’m wrapping an empty box of Bearpaw slippers. Don’t do that either. 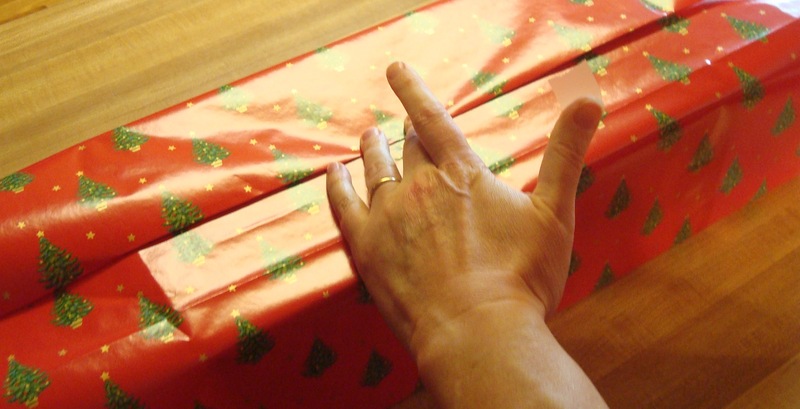 But if you insist on giving your Valentine an empty slipper box wrapped in Christmas paper, please don’t involve BeckyLand when you shirk any more of your seduciary responsibilities. Note that the box is upside down. On purpose. You want the seams to be on the bottom of the package. 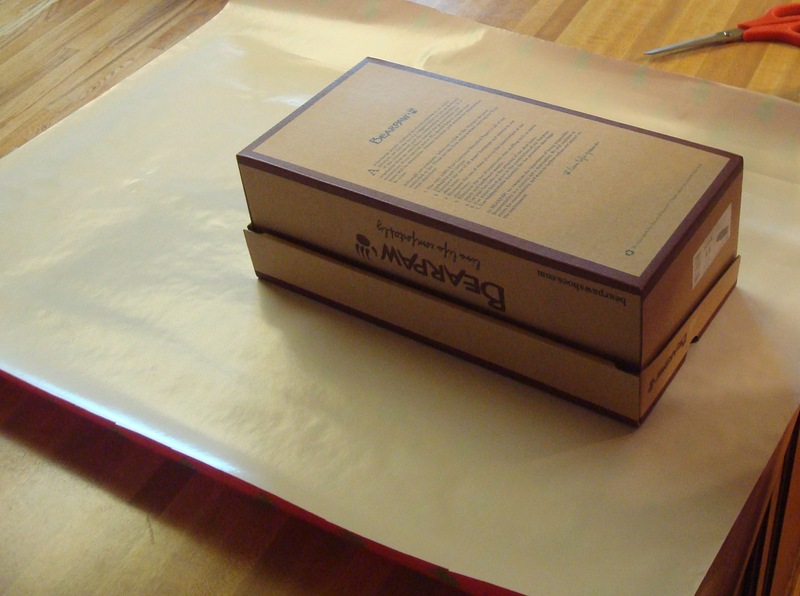 The key to a lovely package is to use an appropriate amount of paper. Not too little and not too much. 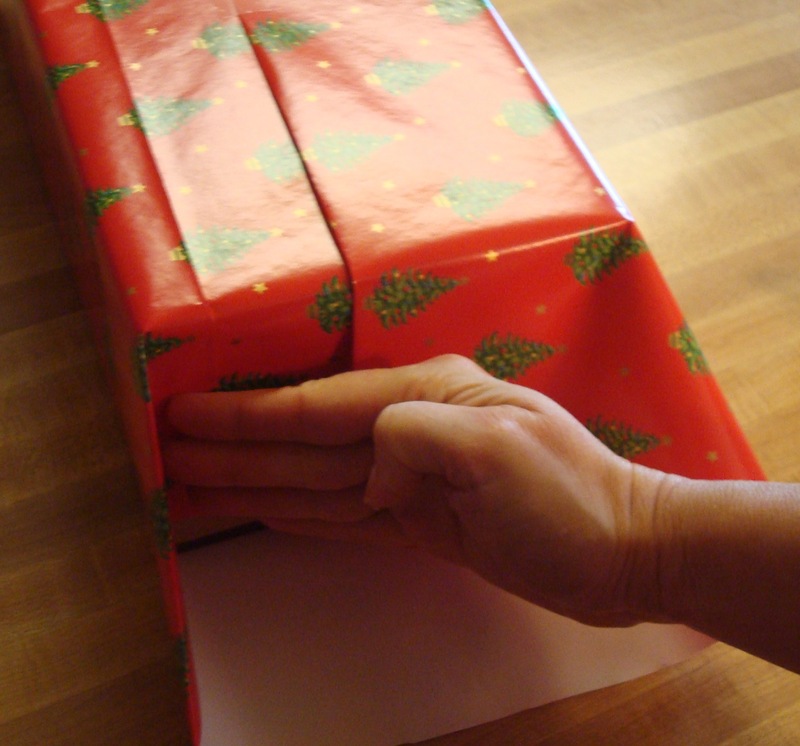 Pull the paper a tad more than halfway across the box. 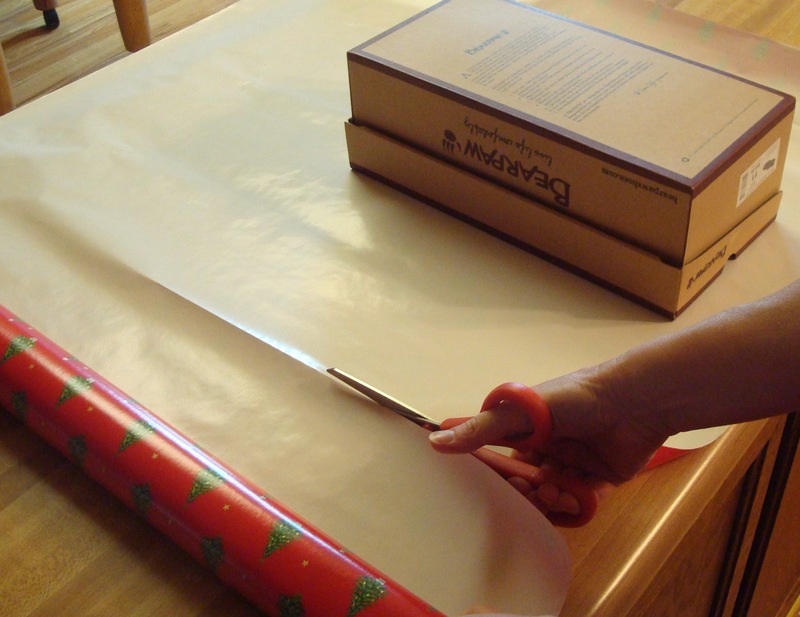 To figure out where to cut the paper, pick up the roll and give it an inch or so margin over the paper. 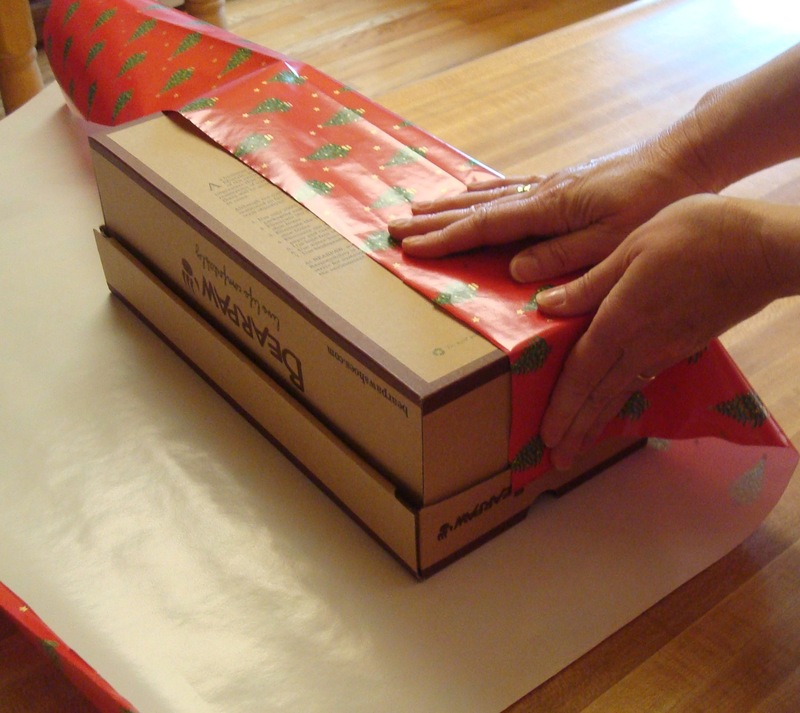 When you’ve got it overlapped an inch or two, roll the paper backward to make a crease in the paper. This will be your cutting line. Cut along the folded line you just made. Yay! An appropriate sized piece of paper … almost. 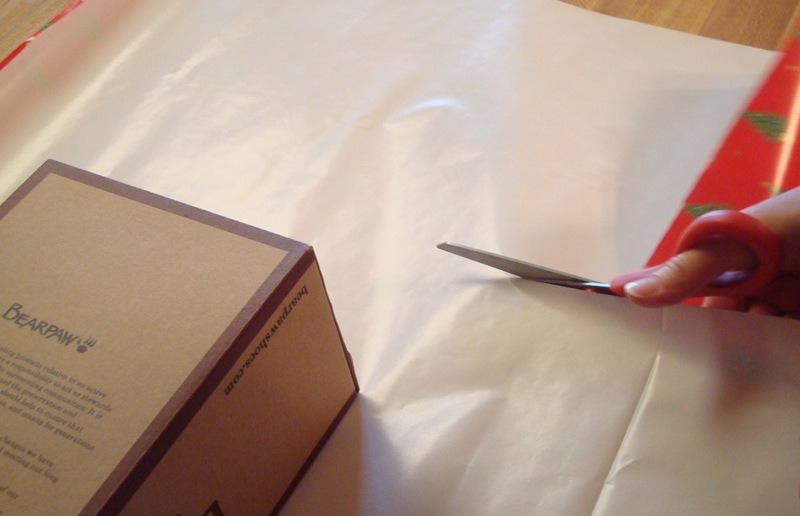 Take one of the ratty cut edges and make a small fold to ‘finish’ the edge. This makes it purty. Shows you have exquisite attention to detail. 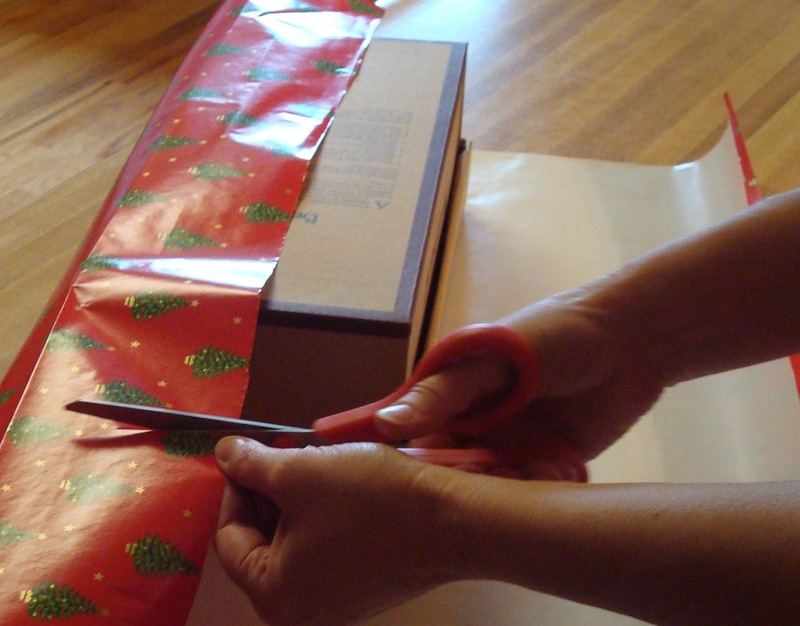 Now you have to cut off the excess paper from the ends, but you only want to cut once. So, place the box where the paper comes down a little more than halfway down the end of the box. This puts it in the right place for one end. Measure the same way on the other end, and mark it with your finger, before giving it a little cut. Cut off the excess paper. It’s easiest to get it started on the top …. 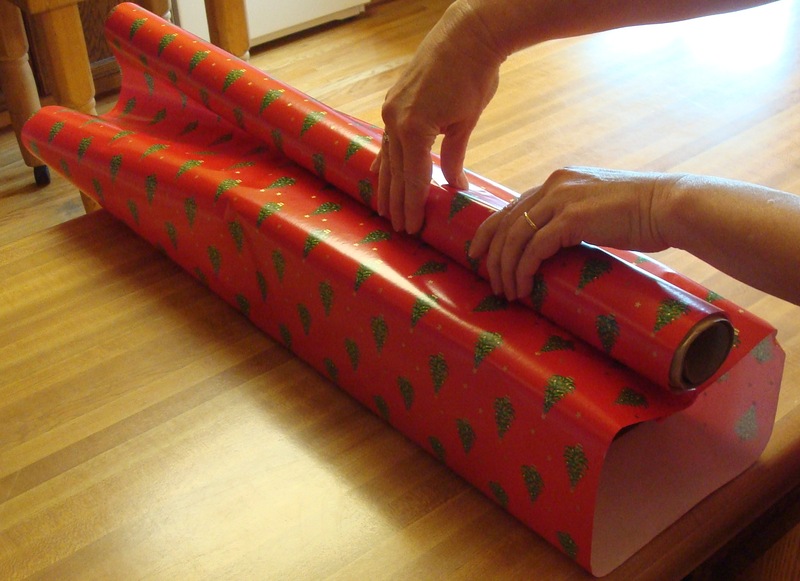 Pull the paper across with the finished edge (remember? when you folded the ratty edge?) on top. Make it even. 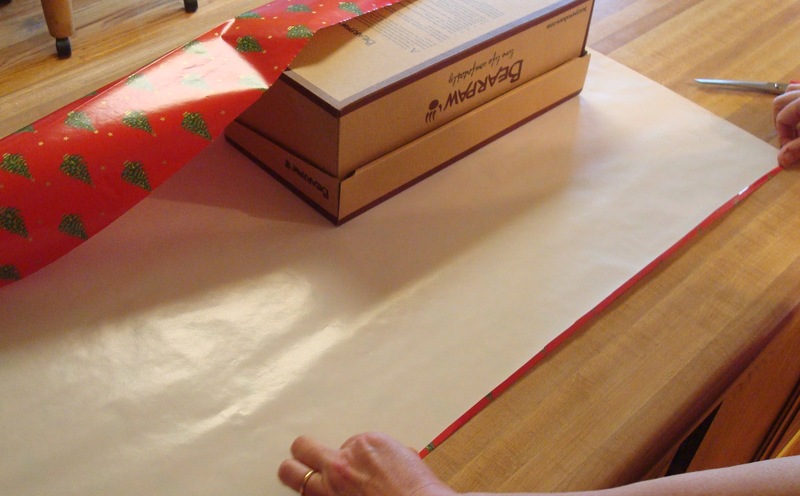 With some paper you can even match up the design, forever marking you as One Awesome Wrapper. You can do this next step by yourself. Trust me. 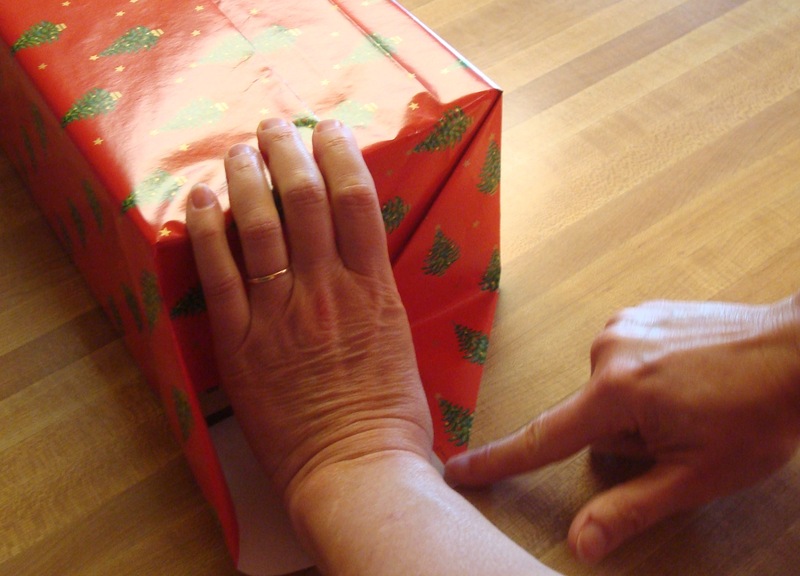 Rest your hand to hold the paper on the box while you tear off a small ”” let me repeat, small ”” piece of tape. You don’t need more than an inch. See the tape on my thumb? 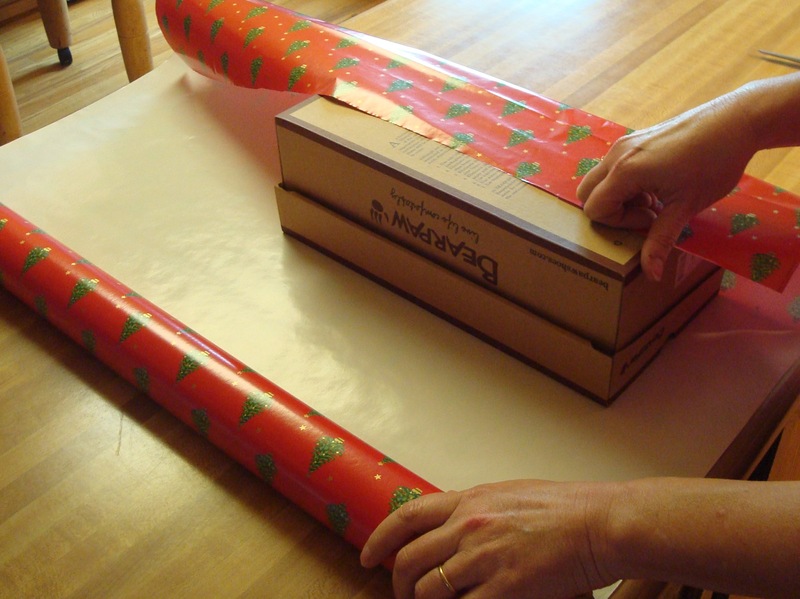 Rearrange your paper as necessary, then tape neatly right down the middle of the seam. … forming an adorable little pointy end. 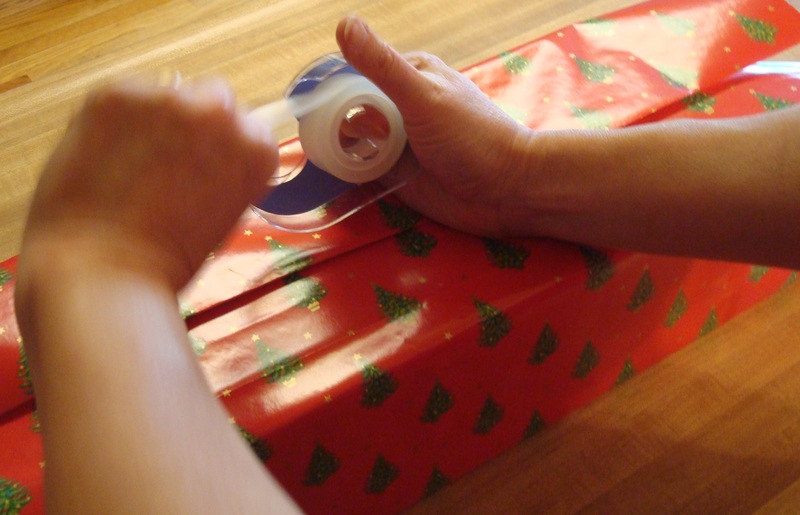 … and tape it using no more than an inch of tape. Ta da! 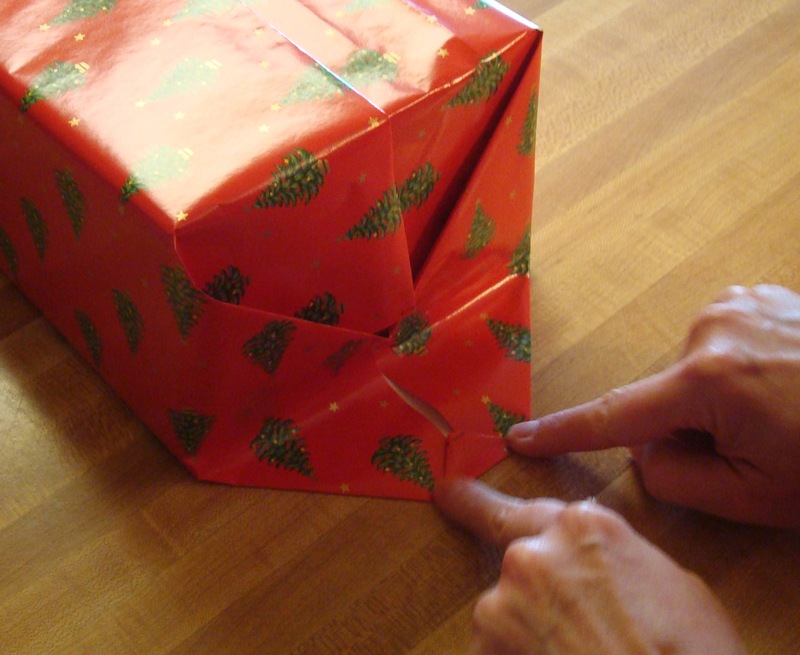 The box is wrapped with only three small pieces of tape ”” assuming you did the same thing to the other end ”” but it might be a little plain. 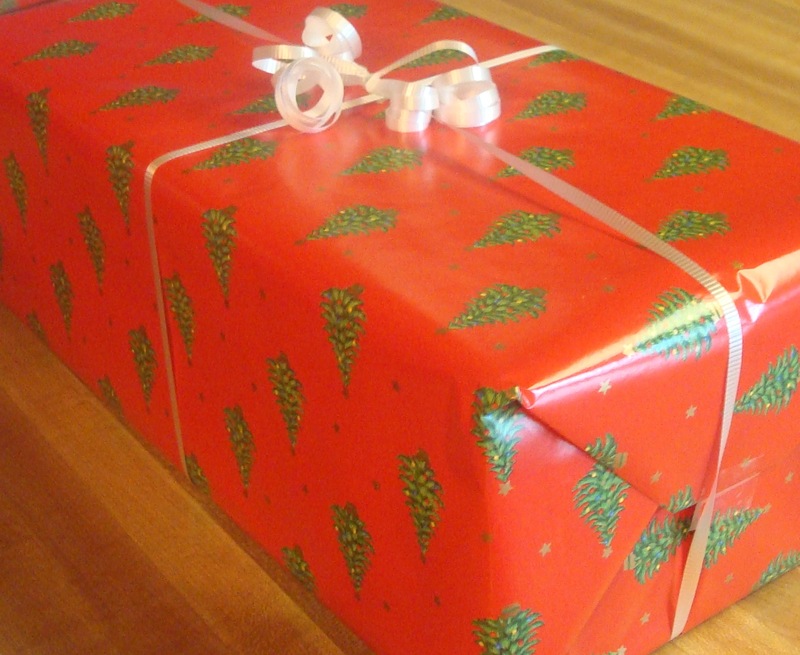 Some wrapping paper is beautiful and ornate as is and needs no further embellishing. But you know what? Embellish anyway. It will be appreciated. There are lots of ways you can embellish. 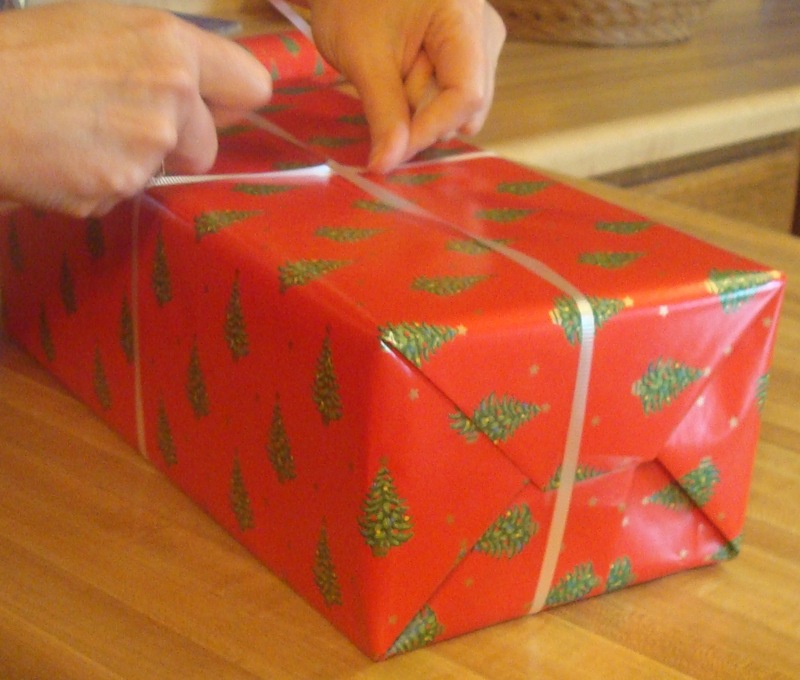 The easiest is to slap a ready-made shiny bow on. We re-use our bows here in BeckyLand, but if it’s a new one, you just peel off the backing and stick ‘er on. 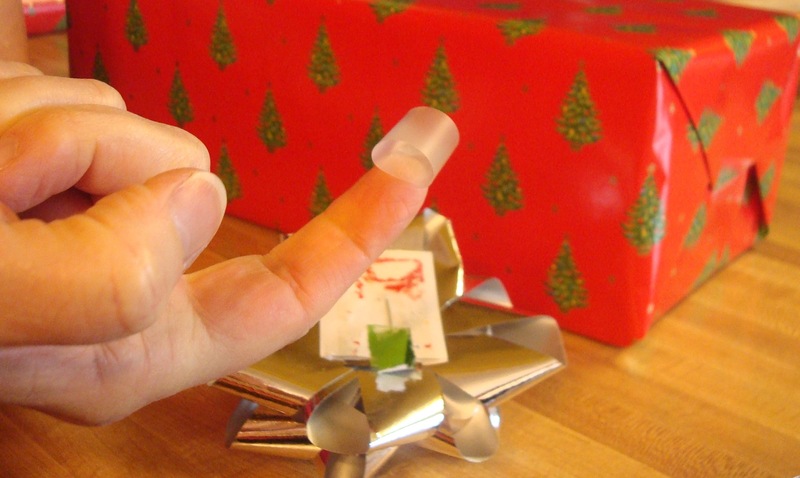 But if it’s a used bow, make a tape doughnut ”” see it there on my finger? 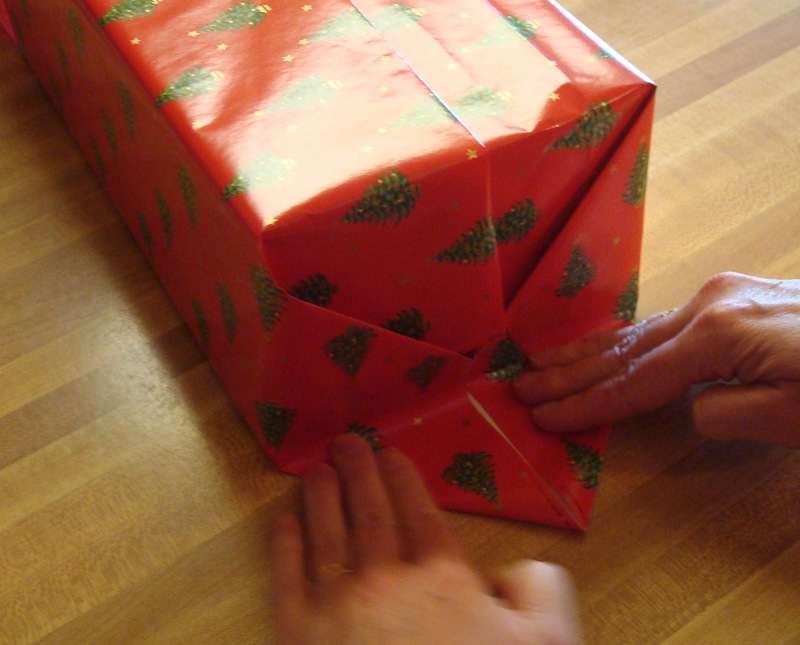 ”” and stick it to the bow which then sticks to the package. 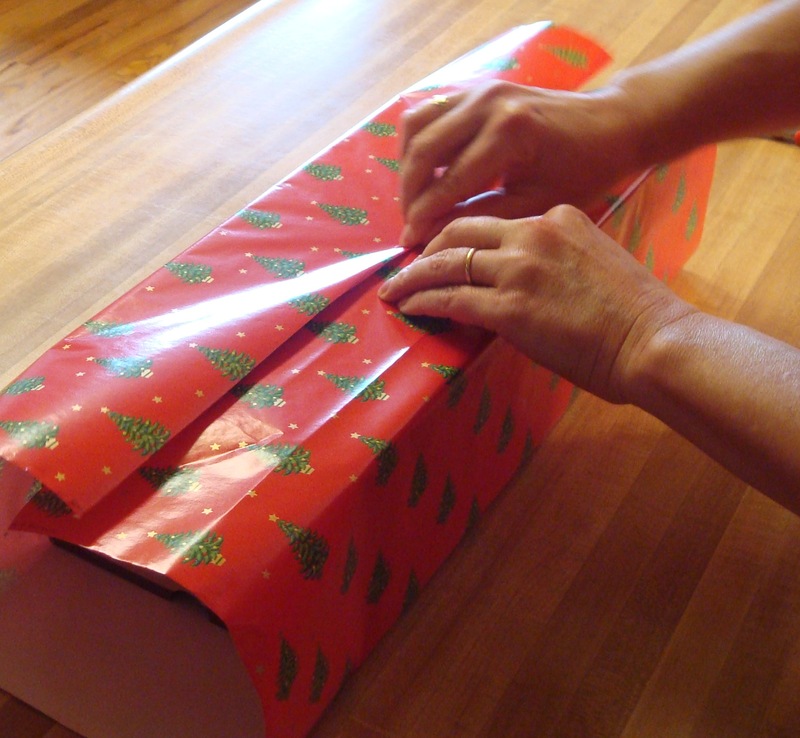 If the package is large, you could make a little tableau of several bows in one color or contrasting colors either in the middle or near one of the corners. 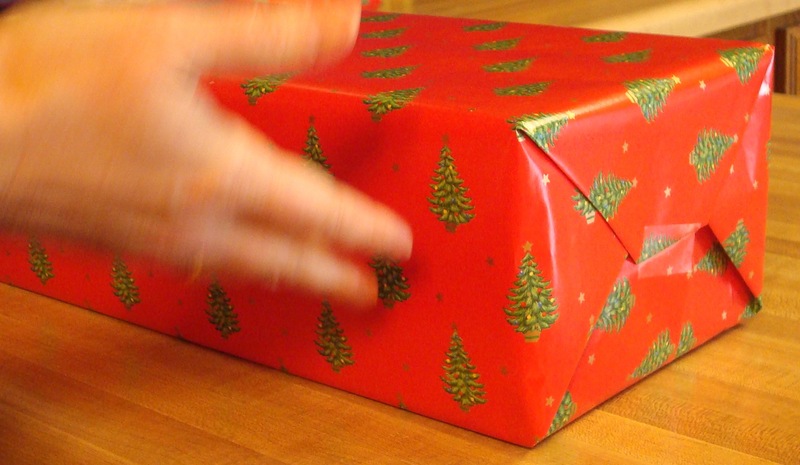 … bring it around to the underside of the package, where you’re just going to twist the ribbon and take it in the opposite direction across the package. 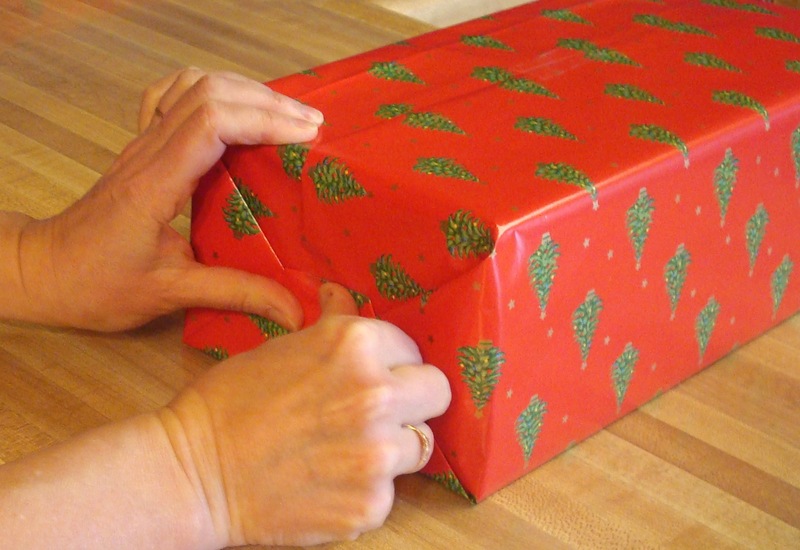 You’ll end up back at the top of the package where you’ll tie a knot in the ribbon. You can also do this without help. 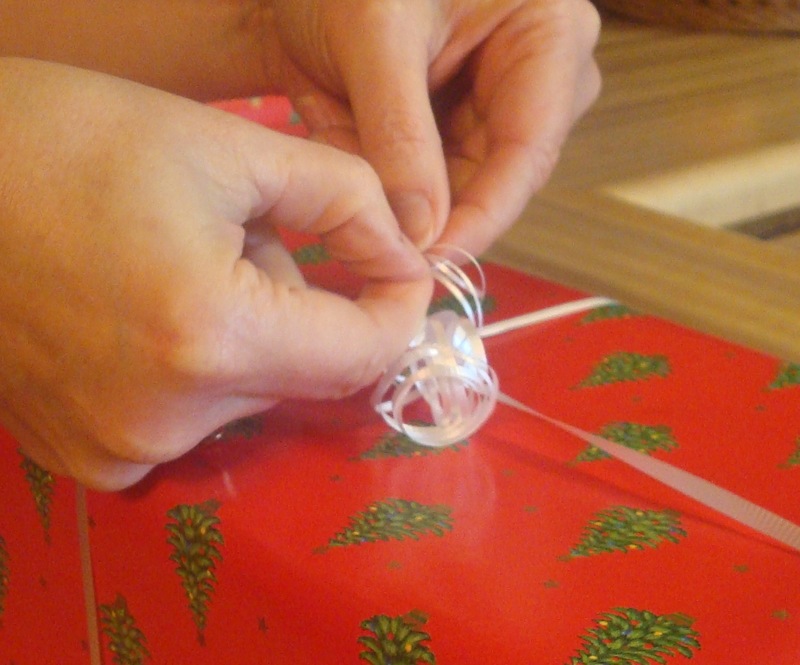 Hold the knot with one finger, then loop the ribbon around, poking one end through and pulling it tight to create the knot. Ta da! Now the curling part. Before you curl, make sure you’re curling it the way it wants to go. See the ribbon hanging there? See how it already has a slight curl? That’s the same direction you’ll want to curl your ribbon. The curling part is easy. 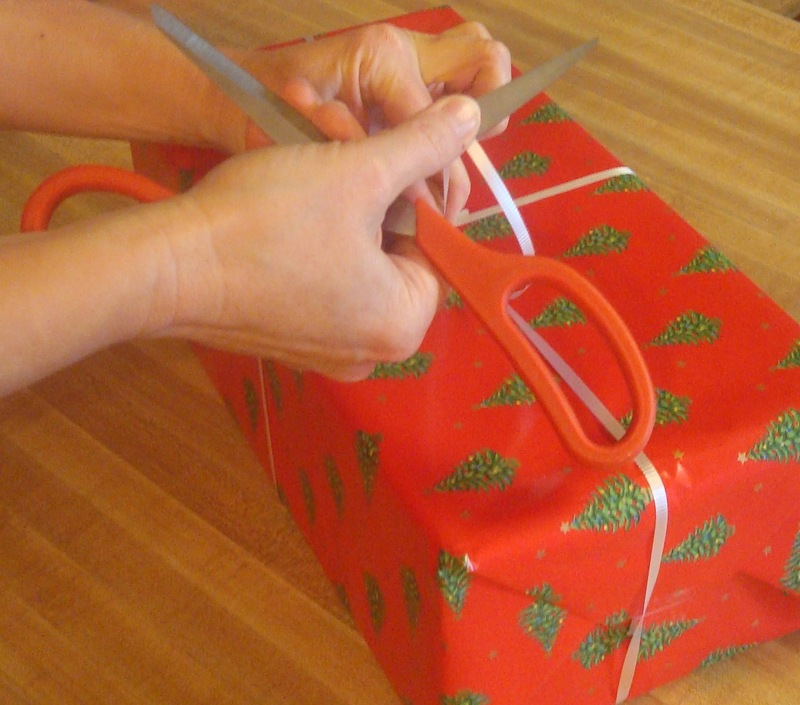 Hold one tendril of ribbon near the knot while you pull one blade of the scissors along the length of the ribbon. 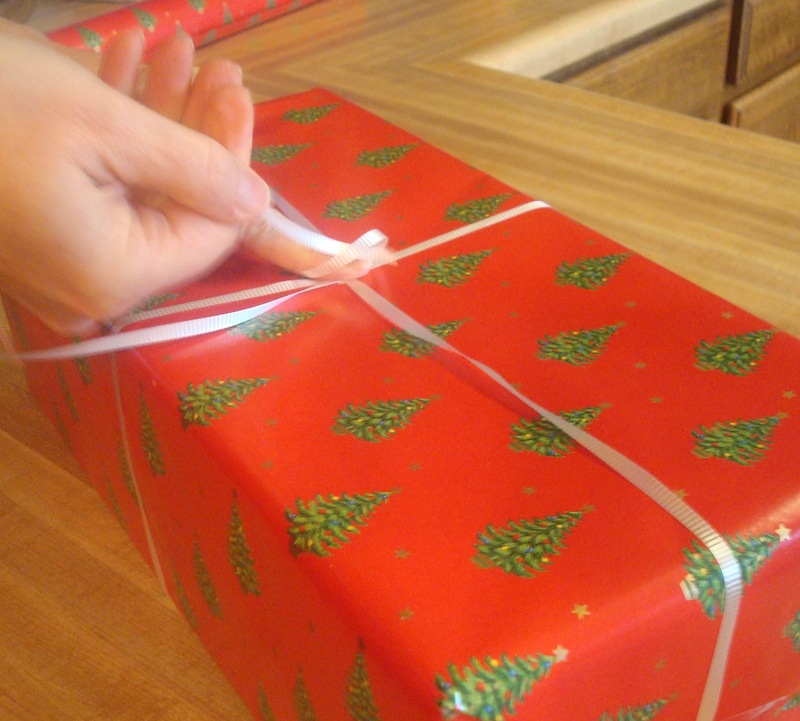 Do this on all the lengths of ribbon on your package. You don’t need to use Superman Strength. Just some slight pressure. If it doesn’t work the first time, you can try again. 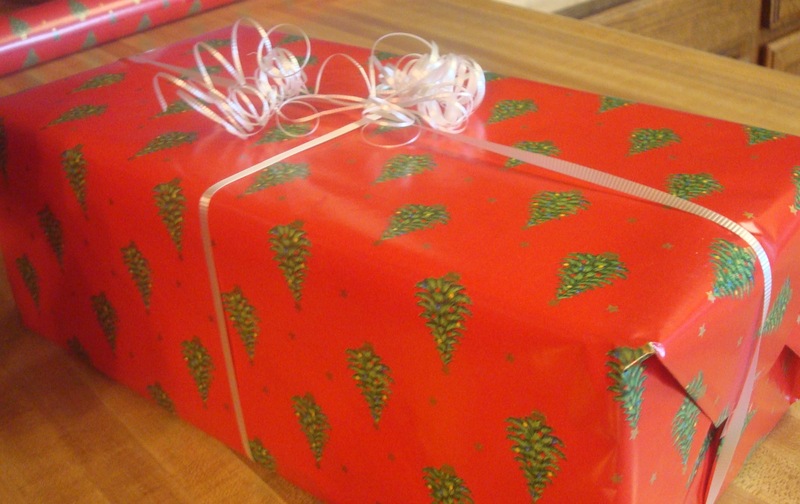 My ribbon was a little too short and looked skimpy on the package so I added another length of ribbon. Just tie it at the knot. You could add different colored ribbon and/or tie them in varying lengths and/or add a bunch more lengths to add interest to the package. Ta da! But it’s not quite fancy enough. This is my friend, Mr Ribbon Shredder. It’s a very simple tool with springs on the four corners and a row of teeth in the middle. If you live with someone female, there’s an excellent chance you could put your hands on one of these too. 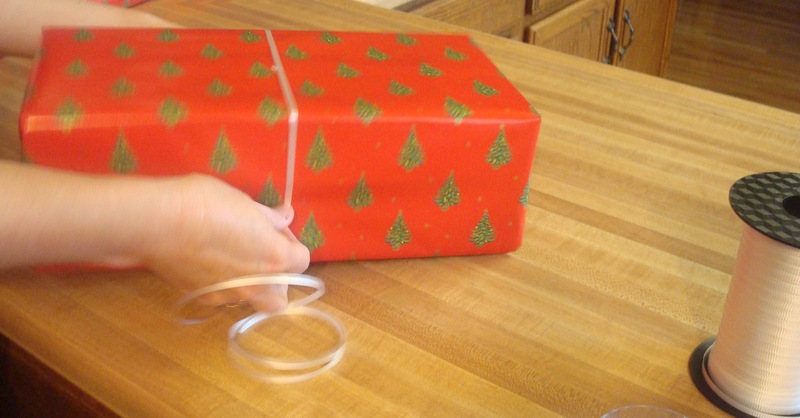 If you don’t have a friendly ribbon shredder, you should go back and add more curling ribbon. Just sayin. This little tool shreds each of those ribbon lengths, basically making four or five tiny strands from the one larger strand. Just slip one tendril of ribbon through the teeth ”” keeping the tool open-mouthed for now ”” and pull the tool as close to the knot as possible. 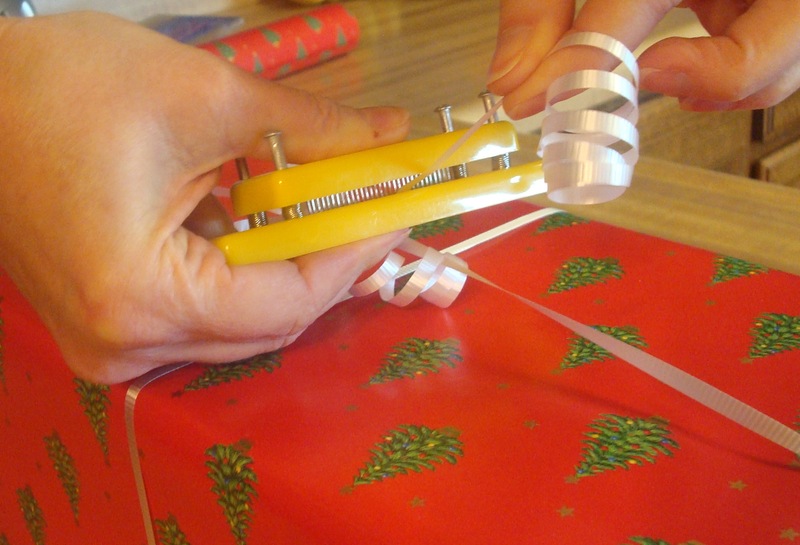 Then bite the teeth onto the ribbon and slide it the length of the ribbon. Because you won’t be able to get right next to the knot, tear the ribbon the rest of the way by pulling apart the strands a little bit more. Again, a finishing touch. 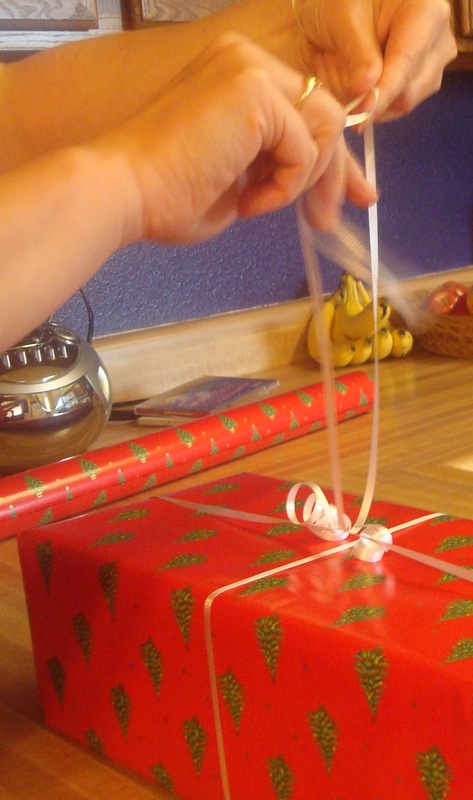 See how more ribbon makes it prettier and more festive? You can leave it as is or add a bow in the center. Uber-festive! 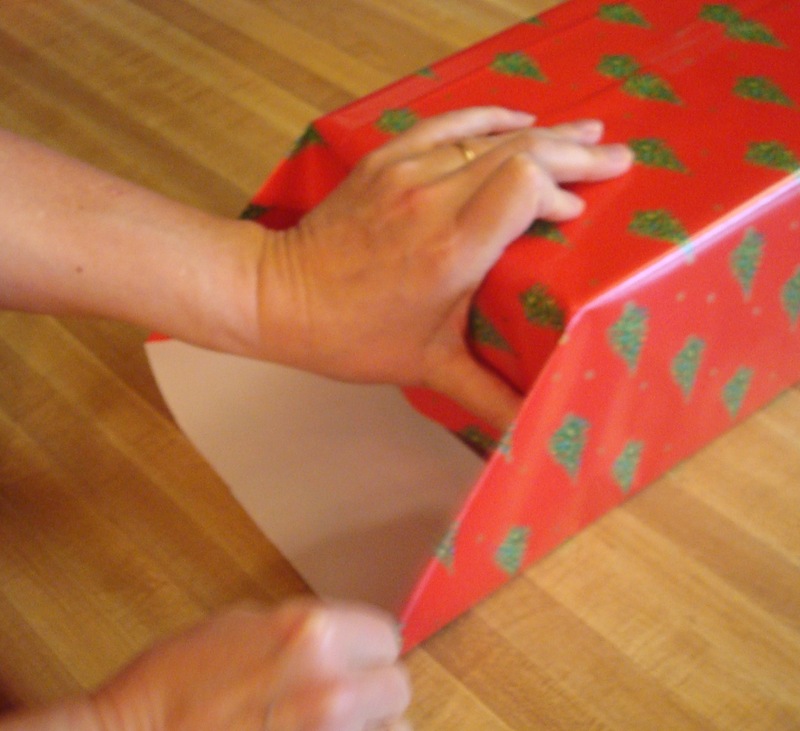 This entry was posted in Goofy Stuff and tagged Becky Clark, gift wrapping, how to wrap, How to wrap gifts, how to wrap presents, Valentines day gifts on February 10, 2010 by Becky.